This study looked at output levels produced by new generation personal music systems (PMS), at the level of eardrum by placing the probe microphone in the ear canal. Further, the effect of these PMS on hearing was evaluated by comparing the distortion product otoacoustic emissions and high frequency pure tone thresholds (from 3 kHz to 12 kHz) of individuals who use PMS to that of age matched controls who did not use PMS. The relationship between output sound pressure levels and hearing measures was also evaluated. In Phase I output SPLs produced by the PMS were measured in three different conditions - a) at volume control setting that was preferred by the subjects in quiet b) at volume control setting that was preferred by the subject in presence of 65 dB SPL bus noise c) at maximum volume control settings of the instrument. In Phase II pure tone hearing thresholds and DPOAEs were measured. About 30% of individuals in a group of 70 young adults listened to music above the safety limits (80 dBA for 8 hours) prescribed by Ministry of Environment and Forests, India. 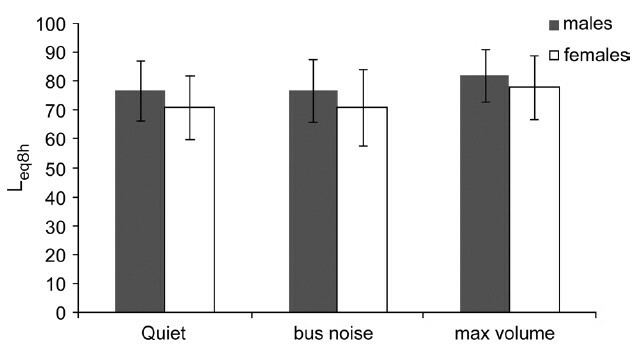 Addition of bus noise did not increase the preferred volume control settings of the subjects significantly. There were no significant differences between the experimental and control groups for mean pure tone threshold and for mean DPOAE amplitude comparisons. However, a positive correlation between hearing thresholds and music levels and a negative correlation between DPOAE measures and music levels were found. Heavy metals are chemical elements with a specific gravity that is atleast five times that of water which is 1 at 4°C. The commonly encountered heavy metals are lead,mercury, cadmium, and arsenic. Lead levels in children continue to be a health hazard as the current limit of 10ug/dL is considered too high with the WHO estimate of 40% of children having blood levels greater than 5ug/dL. Some authors have suggested a new limit should be set at 2ug/dL. There are substantial differences in the literature regarding the effects of lead on hearing as assessed by pure tone audiometry. Mercury causes hearing loss and neurological dysfunction in Humans and animals. Methyl mercury is considered a more toxic compound to mercuric chloride. Cadmium causes a range of health effects from lung cancer, kidney damage to hearing loss. Dose dependent effects on hearing loss have been shown in rats. Combined effect with noise exposure has been shown to be more pronounced. Arsenic is released into the environment through the smelting process of copper, zinc, and lead. It is usually found in the water supply. Hearing impairments have been noted in the low and high frequencies in conjunction with balance disturbance. 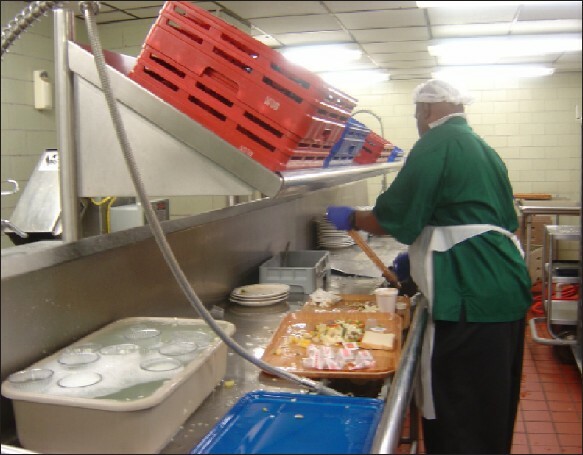 In March 2007, the National Institute for Occupational Safety and Health (NIOSH) was asked to evaluate the noise exposure of employees in the Nutrition and Food Services Department of a large hospital, because of noise concerns raised after the installation of the PowerSoak® dishwashing system. Eleven employees (two cooks, eight food service workers, and a materials handler) contributed 13 full-shift and two task-based personal noise dosimetry measures over two days. The noise levels for two food service workers assigned to the pots and pans room (85.1 and 85.2dBA), a cook working in the food preparation area (85.9 dBA), and a food service worker assigned to the dishwashing room (89.5 dBA) exceeded the NIOSH Recommended Exposure Limit (REL); however, none of the measures exceeded the Occupational Safety and Health Administration (OSHA) Permissible Exposure Limit (PEL). The noise level from the PowerSoak® dishwashing system alone was not excessive, but additional noise from the food preparation area (primarily from blenders and utensils), and from metal-to-metal contact between stainless steel pots and pans and metal racks, may explain exposures above the NIOSH REL for employees in the pots and pans room. The cooks were exposed to many intermittent impact noise sources, such as, metal-to-metal contact between utensils and the use of industrial-size blenders. We recommended that metal-to-metal contact be reduced as much as possible throughout the Nutrition and Food Services Department, and hearing protectors be provided to employees in the dishwashing room until engineering controls were in place. Noise is a stressor. Noise-induced stress can lead to release of stress hormones. Acute stress whether physical or psychological is necessary for adaptation to change. However, chronic stress can lead to the persistent elevation of hypothalamic-pituitary-adrenocortical hormones, which are detrimental to health and can lead to disease states. It has also been suggested that there may be multiple interactions between the sympathetic and the complex feedback neuroendocrine systems, which interact with the immune system, in the genesis of the observed effects. Thus noise stress may be a factor contributing to the mechanisms of noise-induced hearing loss through alterations in the cell-mediated immune response. Other than the noise stress acting directly, it may also have an impact on the immune function via noise-induced sleep deprivation. Furthermore, recent evidence indicates that the immune function may be modified by conditioning techniques, perceived control, or the individual's ability to cope with stress-inducing factors. This suggests a possible means of alleviating the stress-induced effects. This review will examine the current available data on the effects of chronic environmental noise exposure on immune function. There have been several studies that have demonstrated a link between the hearing loss of subjects and tinnitus. However, there has been no systematic evaluation of the link between perceived tinnitus distress and an underlying hearing loss. The purpose of the current study is to explore this association, and ascertain whether a subject's hearing loss contributes to the handicap caused by tinnitus. A group of 96 adults were evaluated with Pure Tone Audiometry and a questionnaire that included the Tinnitus Handicap Inventory (THI). In 58% of the subjects, the side of the unilateral or worse tinnitus corresponded with the ear with poorer hearing thresholds. A subset of the THI, the Two Question Mean (TQM) that was related to questions with regard to communication, correlated significantly with the hearing thresholds in the better hearing ear ( P < 0.01). 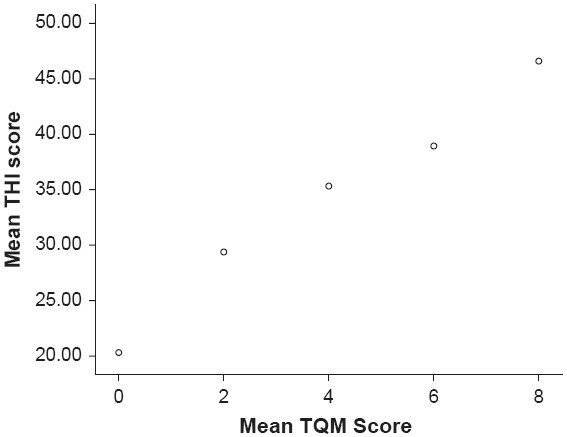 There was also a significant correlation between the THI and TQM scores ( P < 0.01). These results suggested that in tinnitus subjects with impaired hearing, the underlying hearing loss may be a significant factor in the perceived distress. Noise is a stressor that affects the autonomic nervous system and the endocrine system. Under conditions of chronic noise stress the cardiovascular system may adversely be affected. Epidemiological noise studies regarding the relationship between aircraft noise and cardiovascular effects have been carried out on adults and on children focussing on mean blood pressure, hypertension and ischemic heart diseases as cardiovascular endpoints. While there is evidence that road traffic noise increases the risk of ischemic heart disease, including myocardial infarction, there is less such evidence for such an association with aircraft noise. This is partly due to the fact that large scale clinical studies are missing. There is sufficient qualitative evidence, however, that aircraft noise increases the risk of hypertension in adults. Regarding aircraft noise and children's blood pressure the results are still inconsistent. The available literature was evaluated for the WHO working group on "Aircraft Noise and Health" based on the experts' comprehensive knowledge in this field. With respect to the needs of a quantitative risk assessment for burden of disease calculations an attempt was made to derive an exposure-response relationship based on a meta-analysis. This association must be viewed as preliminary due to limitations which are concerned with the pooling of studies due to methodological differences in the assessment of exposure and outcome between studies. More studies are needed to establish better estimates of the risk. Road traffic noise exposure leads to annoyance and impairment of quality of life and may impair health. If this association is causal, a reduction in noise exposure should result in a reduction in noise annoyance and improvement in quality of life. This study examines whether the reduction in road traffic noise following the introduction of a bypass leads to reduction in noise annoyance and common mental disorder and an improvement in quality of life. Repeated measures field study with intervention in three small towns in North Wales, UK. Participants were residents 16 to 90 years living in areas of high or low exposure to road traffic noise. At baseline there was no difference in annoyance, quality of life or common mental disorder between traffic noise exposed and quiet areas. There was a small reduction in noise exposure (2-4 dBA) with the opening of the bypass. There was no reduction in noise annoyance and no change in levels of common mental disorder and quality of life following the introduction of the bypass. Traffic noise reduction associated with the introduction of the bypass was not associated with measurable changes in quality of life or common mental disorder. This study suggests that reduction in traffic noise level of 3dB or less is insufficient to influence annoyance or mental health. However, the methodological difficulties of the study limit the conclusions that can be drawn on whether there is a causal effect of noise on common mental disorder. 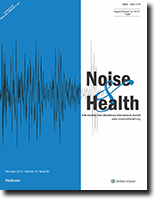 The possibility of non-auditory health effects in connection with occupational exposure to high level sound is supposed by some researchers, but is still debated. 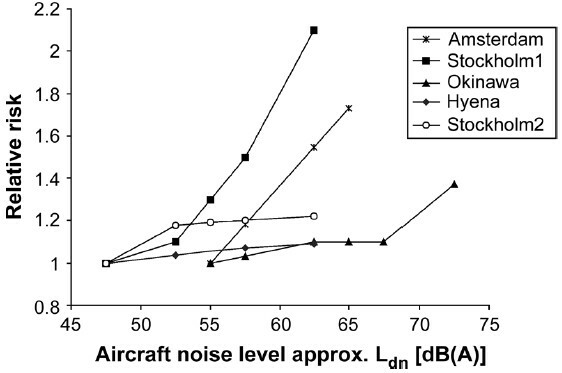 Crew chiefs on airfields are exposed to high-level aircraft sound when working close to aircraft with running engines. We compared their health status with a similar control group who were not subject to this specific sound exposure. Health records of 42 crew chiefs were compared to health records of 42 aircraft mechanics and 17 former crew chiefs. 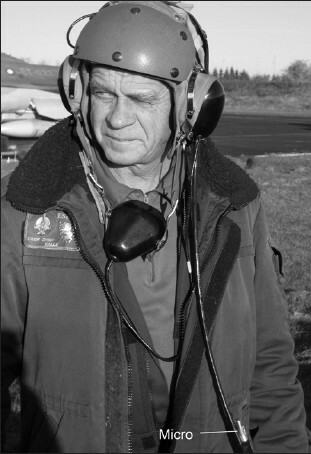 The specific sound exposure of crew chiefs was assessed. The number of reported disease cases was generally small, but generally slightly higher among mechanics than among crew chiefs. Diseases of the ear were more frequent among crew chiefs (not significant). Former crew chiefs reported fewer diseases of the ear and more airways infections (both significant). The sound exposure during launch was up to 144 dB (peak) and 124 dB (L eq ), but for limited time. The study did not reveal a higher disease frequency in general among crew chiefs. However, it did reveal a tendency to ear diseases, possibly due to their exposure to high-level sound.